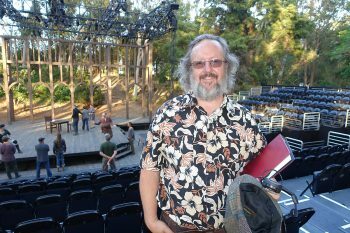 As Tom Hanks shimmies into a fat suit for his first Los Angeles stage performance as Sir John Falstaff, lighting technicians Curtis Scheu and Ken Berry sit at an ETC Ion and run a final channel check for the opening of Henry IV. Performed in the sylvan setting of the Japanese Gardens at the West Los Angeles VA Center, the production not only featured the L.A. stage debut of Tom Hanks but also the debut of a crew made up of veterans training for a career in professional theatre. The Shakespeare Center of Los Angeles employed more than 20 veterans to learn set construction, wardrobe, stage management, and lighting. Which means U.S. Army veteran Ken Berry, who served as a corporal in the US Marine Corp from 1981-1985, has been onsite since early May. He helped hang and focus more than 200 ETC Source Fours in the rig. Then, skipping the stuffy tech booth, he learned to program the ETC Ion console perched on a scaffold platform in the garden’s tree line with a view overlooking the city. Asked about his first introduction to live theatre he says: “This has been an amazing experience – I had no idea what went into a production like this. I would love to work in theatre lighting. I know there’s a lot to learn.” His teacher is also a student. Curtis Scheu is a sophomore in the theatre/business program at the University of Redlands, where production lighting designer Trevor Norton runs the lighting department. Lighting Designer Trevor Norton at a Henry IV rehearsal. “At U of R my students train on the ETC Ion,” says Norton. 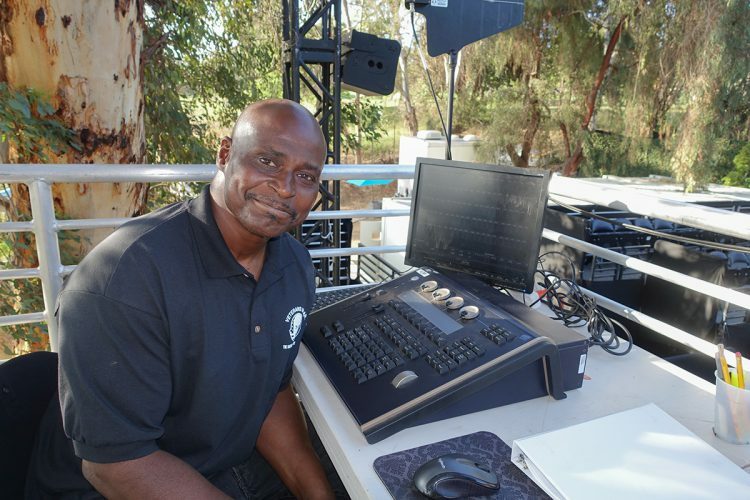 “The Ion is my go-to console for teaching and for most productions that have a blend of conventional, moving, and LED fixtures.” In Henry IV the Ion does double duty for stage lighting and the hundreds of Source Four PARs and festoon lights that adorn the gardens and outdoor picnic areas. Norton has designed countless outdoor productions in his twenty-year history with the Shakespeare Center of Los Angeles, and his dedication to ETC and their Eos family hasn’t waned. “I just got the U of R department to add another Ion,” he notes. L.A.’s local production community came together to support the Shakespeare Center of Los Angeles’ sponsorship of veteran programs. Lighting for the stage and Garden was donated by PRG. All Access Inc. provided the stage and audience platforms, and SGPS the ground support and lighting grid. Acey Decy Lighting provided part of the Garden lighting and Cat supplied the generators for the run of the show.